This article defines the most frequent causes of hand injury, as well as a guide to glove selection. The hands are a part of the body that is very important and most often injured. These injuries are sometimes difficult to heal. Hand injuries are preventable by identifying the workplace hazards and developing safety measures that could mitigate these risks. In doing this, you and your employer can do a lot to prevent your hands from being among more than 500,000 injured in the world every year. One thing to remember is that the hands and wrists are a complex system of bones, tendons, ligaments, muscles, blood vessels and nerves protected by strata of skin. A total of 27 bones in the hand and wrist are connected to the muscles by tendons. Ligaments link bones together and hold the joints in place. Blood vessels supply nourishment to all these parts. Nerves help to transport sensations and control hand and finger movements. Hand injuries are considered the most frequently occurring body injuries, the treatment of which takes a long time and comes at great community expense. A similar conclusion was reached when comparing activities before 11,322 injury-producing incidents (83% OSHA-recordable, 13% first-aid only) in a large petrochemical manufacturing industry. The percentage distribution of the four basic activities prior to OSHA recordable or first-aid-only injuries were identical (Laughery and Vaubel, 1993). The most occurring injury types were lacerations, burns and contusions to the fingers and arms. These studies suggest that the components may be somewhat similar for more and less severe injuries, apart from the devastating impact that machinery plays in the most severe injuries – amputations. Protection against less severe hand injuries may also protect against the significant severe ones. Millions of workers risk hand injuries every day on the job. While many of the risks are not obvious, others are severe. Take a moment to reflect on the Wetterhahn tragedy, in which a college researcher spilled a few drops of dimethylmercury on her gloved hands during transfer of the chemical from a vial to a test tube. Ten months later, she died. Why? She did not know that it takes less than 15 seconds for the poisonous chemical to diffuse through the blood stream, breakthrough the blood-brain barrier and affect the central nervous system. Even more importantly, however, chemistry professor Karen Wetterhahn was unaware that the latex gloves she had on did not protect against aggressive chemicals such as dimethylmercury. Severe cases like this point out the need to understand why hand injuries occur and how to protect the hands. A few earmarked solutions are hazard assessments, management commitment, training, personal protective equipment, machine guards, rules and procedures, ergonomic solutions and barriers. Figures for an average hand injury claim range from $3,500 to $6,300, in accordance with Bureau of Labor Statistics. The National Safety Council found the average cost per claim for recordable occupational hand injures to be $1,700 in medical costs in addition to $2,500 in indemnity costs. For non-recordable hand injuries, however, the cost is more likely to be around $250. Data published by the National Council on Compensation Insurance shows that the average lost-time workers' compensation claims are within $12,006 for wrist and arm injuries and $7,460 for fingers or hand injuries. The following are case studies of injuries sustained when people do not use gloves. It’s usually a severe injury sustained whenever people do not use hand protection while working. A case study was the one that occurred in an oil and gas industry where personnel sustained a serious injury when involved in a 6” pipe spool installation. The pipe fitter received lacerations to the right ring finger when his hand was trapped between a branch section of the pipe spool and a structural bracing. As a result, the worker was seriously injured. The injured worker was not wearing impact resistant gloves prior to the incident. All over the world, a socio-economic effect of 156 hand injuries was studied. Statistically, among the working population about 50% of hand injuries do occur at work. Amputation and complicated laceration were the most costly and resulted in additional lost work days. Injuries at work result in greater costs because they involve more serious injuries, and because workers that require manual skills would need a higher level of hand rehabilitation to return to work. Unless the labour costs are taken into account, the real impact of hand injuries is greatly underestimated. Many companies take the approach of using automatic processes or implementing engineering and administrative controls that protect hands while at work, in line with OSHA's hierarchy of controls. Despite these efforts, hand injuries still occur. One of the paramount ways of protecting the hands is by conducting a thorough hazard assessment and assessment of the workplace to select appropriate engineering controls, work practices, products and hand protection that is suitable for the jobs performed. According to research scientist Eleanor Fendler: “Selecting the correct skincare regimen requires assessment of workplace conditions and the effect of such conditions on the skin - levels of damage, type and degree of hurt, and the frequency with which such hurt needs to be removed.” Hand protection is the use of gloves to prevent risk and it’s very essential to use the appropriate type. It is important to: select the right gloves having in mind the nature of the job, the glove material and the duration of contact with the chemical or harmful substance; know how to wear and use gloves and other PPE so they fit correctly and comfortably. The suitability and comfort of the user is critical for the glove selection to ascertain the degree of protection. It is designed for and enables the employee to do the job well. Protective gloves are PPE and could be used as the last line of defence in the prevention and mitigation of hand injuries. The primary focus in preventing hand injuries is to eliminate hazards such as pinch points, crush points, impact zones, sharp edges, hot/cold surfaces, and chemical/hydrocarbon exposures where possible, and promote work practices and environments that keep hands away from potential hazards. Safety gloves can be used to protect the hands and employees should know that all gloves could be permeable depending on the nature of the chemical being handled, the extent and duration of contact. According to experts, however, the most expensive glove is not necessarily the best glove for the job. It is always a good point to choose the right glove for the task. Most times the cheap gloves that can be disposed of after each use could be more economical and safer to use. Disposal of the glove reduces chances for contamination. Gloves would become a hazard on some occasions where they become too tight and restrict circulation, and when they are too loose they run the risk of getting caught between moving machinery parts. The following sections detail the different types of gloves, the characteristics and selection methodologies. For more information, refer to the Material Safety Data Sheet (MSDS) for the chemical in use. Take a moment to hold your hands out in front of you. Stare at them. Appreciate them. To injure or lose one or both would be a real shame, don’t you think? According to studies, about 20% of on the job disabling accidents involve the hands. It is important to know that without fingers and hands, the ability to work will be greatly impaired. Human hands are very unique among other primate animals. There is no other creature that can use their hands to grasp, hold, move or manipulate objects quite like humans’ hands can. They are one of our greatest assets and therefore must be protected and cared for. Certain hand injuries could be devastating when they occur. Traumatic injuries from machines and tools with sharp edges can cut hands; staples, screwdrivers, nails, chisels and stiff wire can puncture hands; crushing hands in machinery can cause sprains and crush injuries. Consequently, repetitive motion problems often occurred as a numbness sensation accompanied by severe pains to the hands. Being in contact with toxic chemicals or biological substances, electrical sources, or extremely cold or hot objects can also irritate or burn the hands. Glove selection is based on the types of materials or tools being handled and the potential hazards associated with the task and working environment. Most industrial work tasks require some form of hand protection. The selection of appropriate gloves is an important part of preparing for any task. Workers are expected to always plan their work to minimise exposures to pinch or crush points, hand traps, hot surfaces, sharp edges, and other hand hazards. Glove selection considerations also include potential slips (i.e. if a tool moves unexpectedly, or a worker’s hand slips from its normal position) or equipment malfunction as potential sources of hand hazards. Once the applicable hazards are identified, gloves that help to mitigate those hazards can be selected. The most common current standards for glove quality are ANSI/ISEA105 and EN388. These are voluntary standards and not all glove models are rated using these standards. Gloves selected for use on work premises should have an ANSI/ISEA or EN rating (or equivalent standard) suitable for the intended application. The hands are engaged in almost all activities in a job and they account for about 80% of all occupational injuries in workplaces. As such, they are very important. They provide dexterity required to execute tasks. In fact, hands, as tools, are very versatile and can perform many intricate functions more than any single known tool developed by man. A very important precaution to always take is to wear the correct and approved safety gloves. 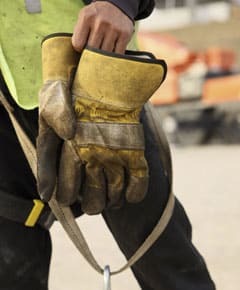 Not all gloves will protect you from all hand injuries, in fact certain gloves could give the wearer a false sense of security and enable worse injury than had gloves not been worn, as is the case with chemical protection. This is no excuse for not wearing gloves, however, it simply necessitates checking for appropriateness of the type of glove prior to use. In addition, certain precautions must still be taken to reduce the level of danger during the execution of tasks involving hand usage. These include locking out machines and power when not in use, ensuring proper clearance before moving loads through, ensuring machines are guarded to avoid accidental exposure of moving parts to the hands and parts of the body. In addition, rings or wedding bands should not be worn when working with machinery, and broken glass or spilled machine parts must not be picked up with bare hands. Remember your hands will obey any commands your brain sends them, so make sure you’re sending the right message.